If I say, “let me tell you about an awesome DIY hair mask”, you’re most likely going to think of castor oil mixed with some lovely little essential oil, coconut oil, or even jojoba oil. But not today! Today I’m going to tell you about a unique, virtuous mixture you can create at home that will revitalize your hair and stimulate growth. What’s this magical mix you ask? Only castor oil and garlic, of course! We are all, at one time or another, concerned with hair problems. The health of our hair varies a lot according to our daily life, stress, our eating habits, the products we use, age, etc. The importance of having a healthy diet can not be over-emphasized. “You are what you eat” is definitely true in this case! Drinking lots of water, for example, works wonders on our skin, nails, and our hair. Taking care of our hair also depends on a good selection of shampoo and, if necessary, a conditioner/hair mask. For several years we have heard about the harmful effects of parabens and aluminum salts in certain beauty products including hair products. The silicone derivatives are indeed to be avoided to the maximum. Why not try organic shampoos? You may not have as much “foam” by washing your hair, and it will appear at first less effective, but you will find excellent results after a while. The more foam there is, the more harmful it probably is for your hair. That’s why I’ve switched from using commercial soaps and instead switched to all natural, Aleppo soap! It’s earthy and only natural. I love it! For some, it is not just about taking care of her hair but managing hair loss, or in some cases, baldness. We usually lose about a hundred strands hair a day, or more! Having your hair fall out isn’t fun. It can be due to stress, food, or an overly-aggressive shampoo. In our older age, the main cause for hair loss in men is due to an excessive production of male hormones, which can be hereditary. In postmenopausal women, a decrease in female hormones and medication may be the cause. Stress will also contribute to hair loss, and less healthy hair in general. Hair got you down? Try not to stress. Natural solutions are more and more advised to counter the harmful affects of stress and improve the quality of our hair in general. Castor oil is the miracle product par excellence, but in this article I wanted to discuss with you another possibility: castor oil and garlic-a recipe for healthy hair. We’ve no doubt talked about the benefits of castor oil on this site before, so this may be a reminder for some. Castor oil contains ricinoleic acid which powerfully stimulates circulation. When applied on your roots, castor oil fortifies, nourishes, strengthens and thickens hair, from root to tip! So why would you want to mix castor oil with garlic? Well, garlic isn’t only for adding flavor to your favorite dish! The virtues of garlic on our health and immune system are already quite reputable around the world. Now more and more, garlic is making it’s way into the beauty world. This strong smelling little garlic will become your new best friend. The reason is simple because garlic is indeed one of nature’s miracles. Rich in minerals (sulfur, iron, zinc, magnesium, etc.) 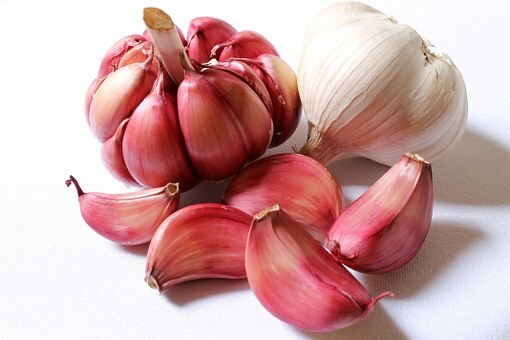 and in vitamins (A, B1, B2, B3, B5, B6, C and E), garlic packs a punch. It also contains trace elements, fiber, proteins, and carbohydrates! Seriously, what doesn’t garlic have? The results on the scalp are very effective in nourishing your hair. In fact, garlic stimulates the scalp right down to the capillary root and naturally fortifies and boosts hair growth. In addition to stimulating hair growth, it also helps slow-down hair loss and fights against dandruff, among other bacteria. Finally, castor oil and garlic will bring back shine to dull hair, softness to course hair, and nourishment to breakage and split ends! Ready to try castor oil and garlic? Look no further! Below you will find my recipe to create your own magical mix of castor oil and garlic. This mix takes a little more time than my other recipes, so practice patience! It’s in order to soften the garlic in the castor oil so that you can better apply it and benefit from it’s powerful virtues. Peel and ground the cloves of garlic until they become a mash. Wash and dry the jar thoroughly before adding the garlic mash. Add the castor oil and mix. Let the castor oil and garlic set and become buddies in the fridge for 5-10 days. After 5 days or so, take the castor oil and garlic mix out the fridge and let it warm up to room temperature or heat for 10 seconds in the microwave. Massage the mix into your roots, all over your scalp. To optimize the results, heat the mix until warm or place a hot towel over your head after application. I usually leave my mixtures on overnight for best results. If you plan to do it during the day, I would recommend leaving it on for at least 3-4 hours. Wash thoroughly with shampoo. If your roots are still oily, it’s okay to do a second shampooing. The garlic odor is not very strong, but I usually rub a drop of almond oil or coconut oil throughout the tips of my hair just to give it a sweeter smell. You can keep the other half of the mixture in the fridge and use within the next week. Use this castor oil and garlic hair mask twice a week for best results! Don’t be discouraged to try this unique mix. My hair was bouncier and fuller after just two applications!! Next Post Castor Oil for Weight Loss ?